Obamacare expanded Medicaid… well mostly…if we skip the politics, here’s what it means. Medicaid provides health coverage for some low-income people, families and children, pregnant women, the elderly, and people with disabilities. In some states the program covers all low-income adults below a certain income level. The ACA expanded Medicaid eligibility to nearly all low-income individuals with incomes at or below 138 percent of poverty ($27,821 for a family of three in 2016). But not all states adopted the expansion, as the states had to pick up the cost. 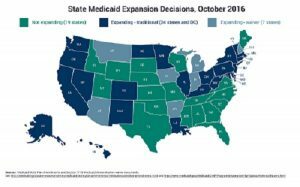 34 states adopted an expansion of Medicaid, which provides subsidized healthcare based on low or no income. 19 states did not adopt the expansion. This means that if you are unemployed AND you live in one of the following states, you may qualify for Medicaid. Alabama, Florida, Georgia, Idaho, Kansas, Maine, Mississippi, Missouri, Nebraska, North Carolina, Oklahoma, South Carolina, South Dakota, Tennessee, Texas, Utah, Virginia, Wisconsin, Wyoming. How do you find out if you qualify for Medicaid in your state? You find out if you qualify for Medicaid and CHIP in your state by contacting your state Medicaid Department or Healthcare.gov. Some states have their own unique eligibility rules, that could work either in your favor, or against you so be thorough and persistent.. This page on HealthCare.gov walks you through the eligibility process.